A brand new BMW 5 Series hit the road in 2017, so it's time to look at its predecessor as a used car. Here we deal with the sixth generation BMW 5 Series, referred to as the F10 in four-door saloon guise, though it was also available as the Touring estate and the Gran Turismo hatchback. Neither of those is as popular as the regular saloon, of course. The F10 replaced a car that was initially deemed to be radical looking and perhaps a little too innovative, which might explain the play-it-safe styling of this car. And in fact, BMW toned down the driving dynamics too, stung by endless criticism of its single-minded focus on driving enjoyment and cornering, at the expense of outright comfort, which, let's face it, is more important to more people. So, the F10 came with crowd-pleasing curvy looks, loads of technology and a chassis that put comfort on an equal footing with agility. No wonder BMW sold so many. Theoretically, the BMW 5 Series model range was vast, but scan the Carzone classifieds and you'll find mostly diesels. For the record, petrol models at launch were the 523i, 528i, 535i and 550i, while a 520i was added after the car's midlife update. Don't forget the high-performance M5 and the ActiveHybrid 5 petrol-electric hybrid, either. The diesel range is nearly as wide, spanning the 518d (only introduced half way through the car's life) and the ubiquitous 520d, then the six-cylinder 525d, 530d and 535d. The earliest examples of the 520d SE have fallen below the €12,000 mark now, though most at that price level come with high mileages, so look for a service history and get the car professionally inspected. 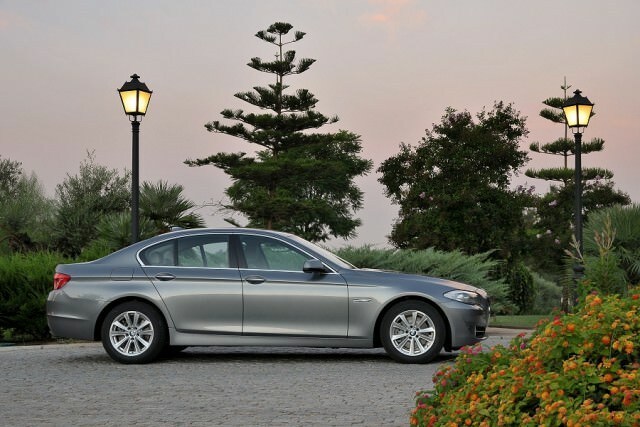 Trim levels for the 5 Series are easy to understand. The vast majority will be in SE or SE Business Edition specifications, the latter enhanced by things such as satnav and leather upholstery, while those that want to stand out should go for the M Sport versions. Make sure you look for the initial purchase invoices, as it was possible to buy the M Sport model without the firmer sports suspension - and that's definitely the best way to go, as the sports suspension works with the larger alloy wheels to seriously undermine this car's comfort. Assuming you travel high enough annual mileage and that a good proportion of it is at motorway speeds (to prevent the DPF and other components from clogging up), then you can't go too far wrong with a BMW 520d SE Business Edition. It has loads of equipment, is comfortable on the road, has plenty of power and is also very economical and relatively cheap to tax every year. Insist on a complete service history and consider buying a car with a warranty, too. History has shown that, when a new generation of the BMW 5 Series is launched, there's even more affection for the model just replaced. And there's not much wrong with the F10 5 Series. So long as you need a diesel car, it's one of the best executive saloons there is.